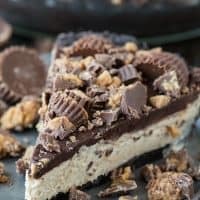 The BEST no bake peanut butter cup chocolate pie! Oreo crust, creamy peanut butter filling, chocolate ganache all LOADED with peanut butter cups! This recipe was updated March 2016 with new photos but it’s the same great recipe! This is my first ever homemade pie. What do you think? Well, it looked pretty good so I decided to have a piece at 9 in the morning when I was doing this photo shoot :) It seemed like a good way to celebrate my first homemade pie! 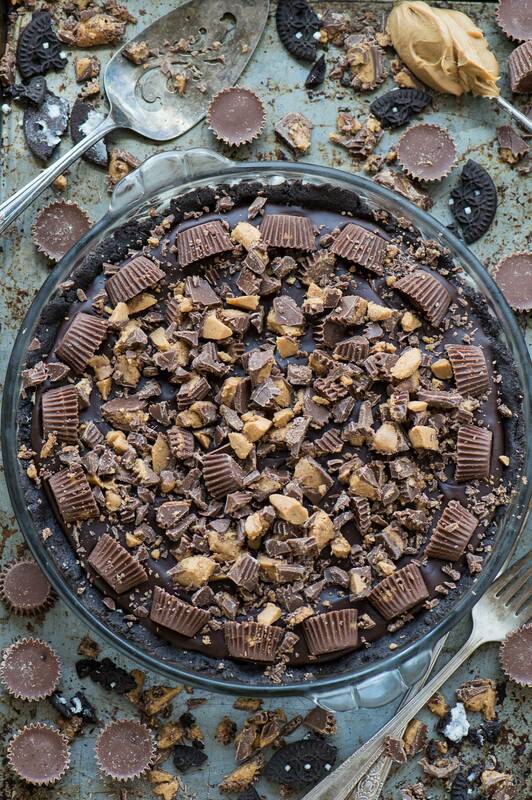 I decided to keep this no bake reese’s peanut butter cup chocolate pie recipe ridiculously simple. No baking, no pie crust, no lattice to weave. 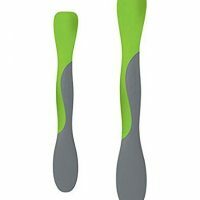 If you can press, pour and chop, I know you can recreate this in your kitchen! You’ll need oreos, butter, creamy peanut butter, cream cheese, cool whip, heavy cream, chocolate chips, and REESE’S! 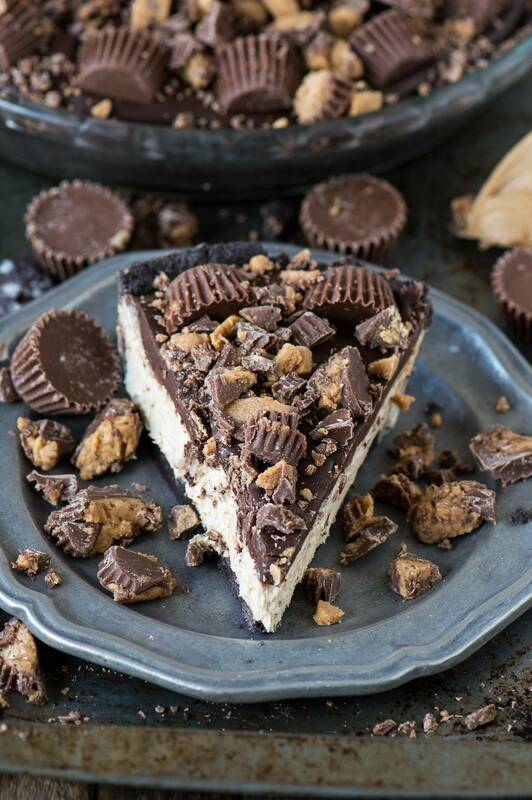 It was really easy to make this Peanut Butter Cup Chocolate Pie gluten free by using gluten free oreos for the crust. All of the other ingredients in the recipe are naturally gluten free, but sadly not calorie free, haha. 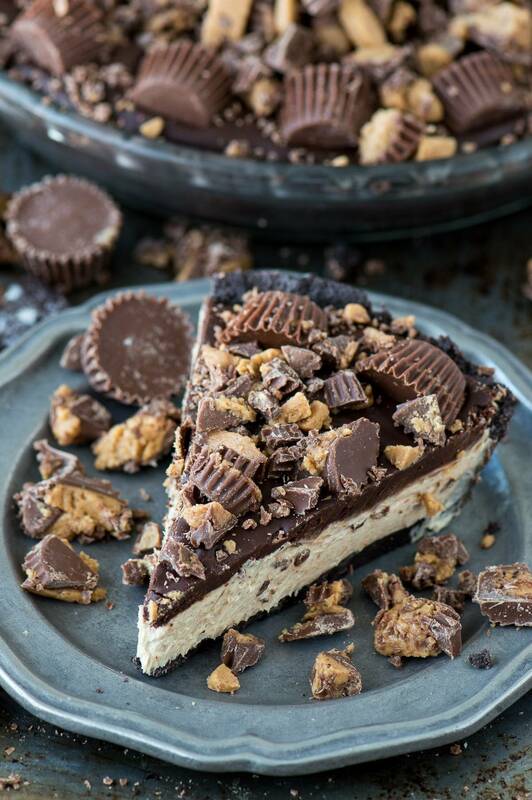 Frozen or refrigerated peanut butter cup pie? Now that I’ve made this pie a few times, I’ve discovered that I prefer it frozen rather then just refrigerated. Even when “frozen” the filling is still creamy and easy to cut through, the only thing that gives a little trouble to cut through is the oreo crust. But I figure I can dish out a little elbow grease for a piece of pie. 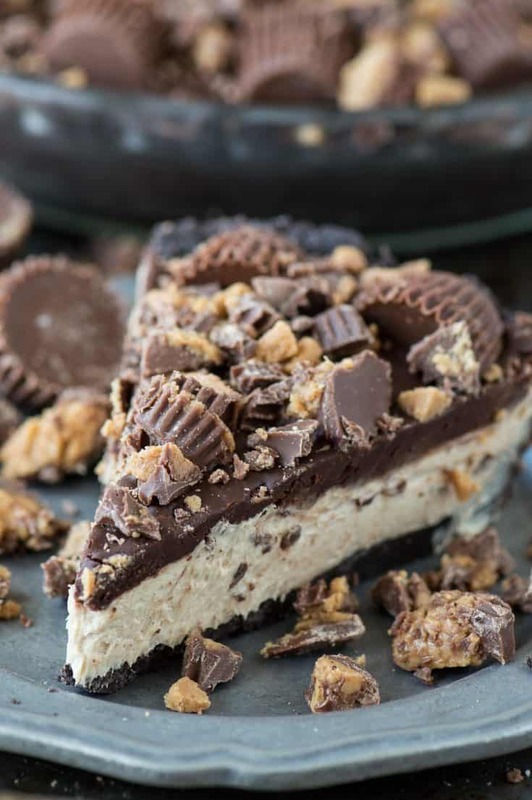 I’m pre-planning for my birthday (in July 😂) and there is no need for birthday cake when you can have this Peanut Butter Cup Chocolate Pie! Process the oreos in a food processor until fine crumbs remain. In a large bowl, combine the crushed oreos with the melted butter. 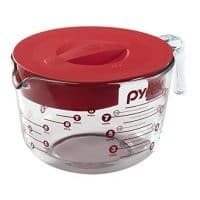 Press this mixture evenly into a 10 inch pie pan sprayed with non-stick cooking spray. Place in fridge until ready to use. In a large mixing bowl, combine the peanut butter and cream cheese with an electric mixer until well blended. Add the cool whip and stir with a spatula until mixed. Spread this mixture on the crust and place in the freezer for 30 minutes. In a small pot over low heat, heat the heavy cream until just before boiling. Allow the ganache to come to room temperature before adding it to the pie. Before the chocolate hardens, add the peanut butter cups. Start by adding the halved peanut butter cups around the edges, placing them as close or as far apart as you want. Then add chopped peanut butter cups to the center of the pie. Cover the pie with tinfoil and return to the freezer or fridge for 1-2 hours. 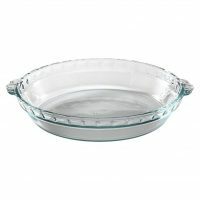 Before serving, remove the pie from the freezer and let it sit for a few minutes to make cutting it easier. Cover and freeze or refrigerate any leftovers. Easily make this recipe gluten free by using gluten free oreos! You have to warn people before posting things like this. I just drooled all over my keyboard. Yum-o! Haha, okay next time I’ll put a warning label! You did an amazing job with this Beth! Nice job for the first time!! Oh that looks delicious Beth!! :-) I could eat a big slice of that for sure! This looks amazing! And I love that it’s simple to make…pinned! That’s my favorite part! Thanks for stopping by Kim! Yum yum yum! This looks amazing Beth! Perfect pie for Pi Day! Im pinning/stumbling/g+ing.. everything! Love this! Oh goodness, thank you Kelley! Wow, mouth watering photos. This looks incredible! You did an awesome job with your first pie Beth, it’s perfect!! G’day! one word Beth? YUM! You are truly putting my diet to the test!!! Pinning for sure! And thanks so much for sharing at the Super Saturday Link Party! Well, I certainly took one for the team.. I think I ate most of that pie! Goodness gracious girl! This looks amazing!!! My kids call Reese’s Chocolate Pies because they think the shape looks like a pie! LOL! Pinning this now! I’d love if you would share this at our link party going on now! That looks brilliant Beth, well done for your first pie. I recently baked my first pie too. I’d love a slice of this though, I can imagine it’s so so delicious! Oh, my – this looks sinfully delicious! 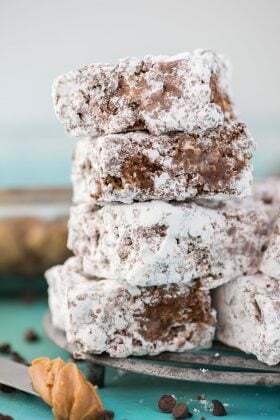 I have a bit of an addiction to all things chocolate, so I just may have to give this recipe a try. I have a serious addiction to all things chocolate! There is nothing better than chocolate and peanut butter! This looks so good! Oh my, this looks simply delectable, delicious! Chocolate and peanut butter really are the perfect pairing. Hi looks looooooovely, if I dont have cool whip, what else could I use? I’m not sure if you would want to use a substitute. Might be worth a trip to the store. Oh my goodness!!! This looks SO delish!!! Thank you for linking up at the Weekend re-Treat link party! Haha oh gosh! I wish! Thanks for coming by! The top of that pie looks so incredible Beth! Thanks for sharing on the weekend re-Treat link party. Hope you link up to the party again tomorrow! Looks amazing, as always. Sharing and featuring tomorrow at Pinworthy Projects Link Party! Woot! Hi Beth! This looks absolutely amazing and I have to try this!!! Thank you so much for sharing at Best of the Weekend – pinned, of course! :) Hope you have a happy and fabulous Friday! Oh my yumminess!! I will certainly be treating me to this! Thanks so much for sharing it on The Mommy Club Link Up. 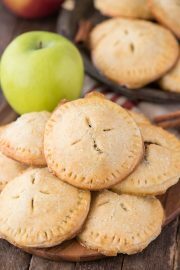 I am featuring your pie on tomorrow’s Tasty Tuesday. Make sure you stop by and grab a featured button and link up again! I made this for a party last weekend, and it was AMAZING! Have you ever tried using reduced fat cream cheese and/or fat-free Cool Whip? Dumb question here, but do you put only the cookie from the Oreo, or cream too? The whole thing, the wafer and the cream! I actually just made this pie tonight! If this is you’re first pie, I officially declare you a pie protege. Peanut butter lovers (*cough* me *cough*) might just lose their stuff over this. Yum!!! Quick question- it looks like there are PB cups in the peanut butter filling too. Are there?? Gonna make this baby tomorrow to go along with Sunday dinner!!! Hi Lisa, no there are not! How many Oreo cookies do you use? I buy the big bulk package from Costco, so I’m not sure how many come in a regular package. Hi Sarah! The standard oreo packages are 14.3 oz and contain about 36 cookies! Is it possible to replace the creme cheese with something else or leave it out? Hi Lorrie, I am not entirely sure. The cream cheese definitely gives the pie stability. Can I just get the store-bought Oreo crust or will that not be big enough/ taste as good? You can definitely use a store bought crust! Planning on making this soon. Can I use less whipped cream and more cream cheese? Hi Robin! I would think that would be okay! The pie does have a rich cream cheese taste already – why are you wanting to use more cream cheese? I just made this yummy looking pie and it turned out beautifully. I got a tiny bit scared though…all the other peanut butter pies I’ve made had icing sugar in the peanut butter mixture. So I added some, even though it’s not in your directions, Beth. I’m wondering for next time, does the peanut butter layer taste sweet enough without adding sugar? BTW, the ganache was fabulous. I have to confess I saved some to put over ice cream. 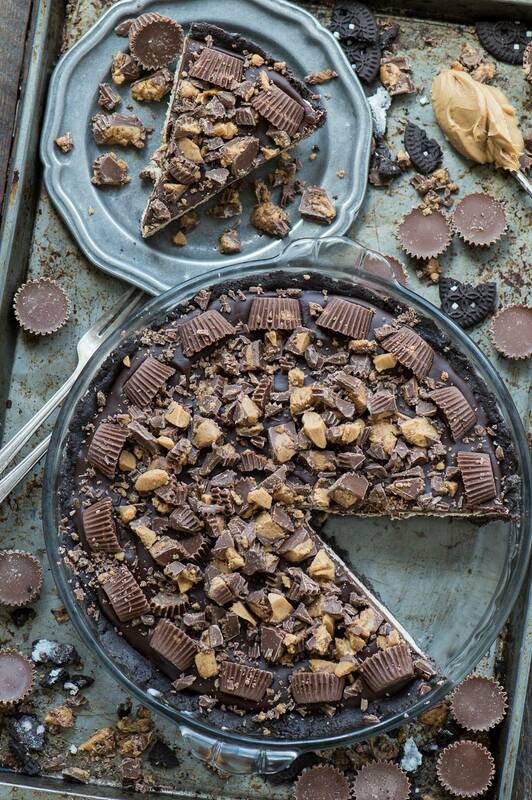 Thanks for sharing an impressive-looking peanut butter pie recipe. I’m sure it will taste as good as it looks! Hi Carole! I think the peanut butter layer is sweetness without any added sugar. 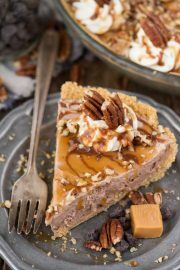 The cool whip definitely adds a little sweetness, but when cut into a slice, there are a lot of sweet things going on with all the chocolate and peanut butter cups! Do I have to use heavy cream isn’t there something else I could use? Hi Janet! 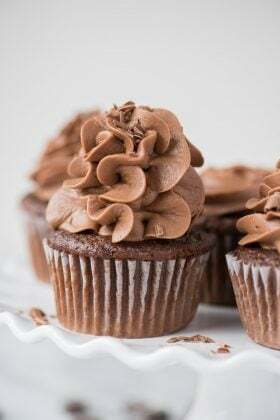 To make the chocolate ganache, you will need to use heavy cream. I hope you have a fantastic 2017 Holiday. Wishing you a very Merry Christmas and the Happiest New Year! I get major pleasure just reading and trying what you put out there so I thank you so very much. 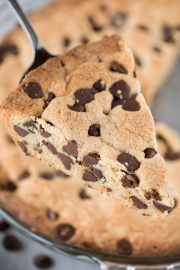 What kind of chocolate chips did you use? Were they semi sweet or milk chocolate? I made these into “cupcakes”: oreo on bottom of cupcake cup, peanut butter filling, ganache, and a quarter reese cup on top. Nice and little dessert appetizers for a party. Thanks for the recipe!